In the book of Esther, we see the Jews facing the greatest peril in their history. If God did not intervene, their very existence as a nation was threatened. But God did providentially intervene and the nation was spared. 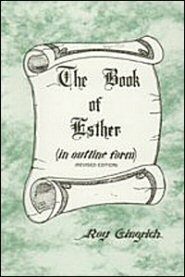 These is no book in the Bible that more clearly reveals God’s providential care over His children, even when they are self-willed and self-determined, than does the book of Esther.This outline commentary first gives us a valuable introduction to the book of Esther, an introduction which discusses the author, the readers, the setting, the purpose, the chief characteristics and the peculiarities of the book. It then gives us an analytical outline of the book, an outline which includes comments on noteworthy things in the text and lessons to us from the text.